Description: In the Roman Empire, travelling was something of a central feature, facilitating commerce, pilgrimage, study abroad, tourism, and ethnographic explorations. The present volume investigates for the first time intellectual aspects of this phenomenon by giving equal attention to pagan, Jewish, and Christian perspectives. A team of experts from different fields argues that journeys helped construct cultural identities and negotiate between the local and the particular on the one hand, and wider imperial discourses on the other. A special point of interest is the question of how Rome engages the attention of intellectuals from the Greek East and offers new opportunities of self-fashioning. Pagans, Jews, and Christians shared similar experiences and constructed comparable identities in dialogue, sometimes polemics, with each other. The collection addresses the following themes: real and imagined geography, reconstructing encounters in distant places, between the bodily and the holy, Jesus' travels from different perspectives, and destination Rome. The articles in each section are arranged in chronological order, ranging from early imperial texts to rabbinic and patristic literature. Contributors: Knut Backhaus, Ewen Bowie, Janet Downie, Kendra Eshelman, Reinhard Feldmeier, Georgia Frank, Sarit Kattan Gribetz, Amit Gvaryahu, Catherine Hezser, Benjamin Isaac, Richard Kalmin, Yonatan Moss, Laura Nasrallah, Maren Niehoff, Jonathan Price, Ian Rutherford, Daniel Schwartz, Froma Zeitlin, and Nicola Zwingmann. 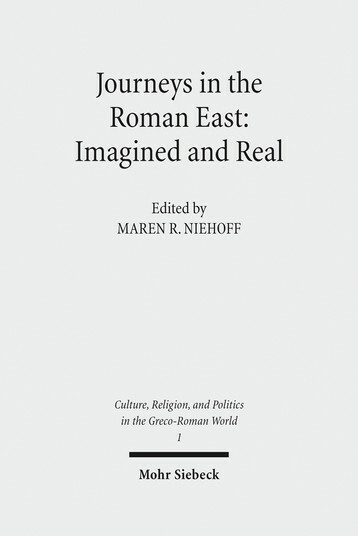 Citation: Joshua Schwartz, review of Maren R. Niehoff, ed., Journeys in the Roman Near East: Imagined and Real, Review of Biblical Literature [http://www.bookreviews.org] (2019).